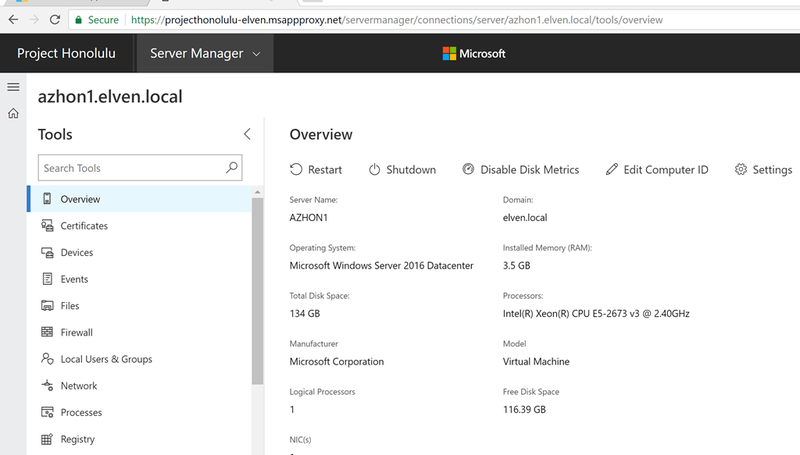 Last week Microsoft announced Project “Honolulu”, the new Windows Server remote management experience, and now you can download a technical preview to install in your own data center, read here for more details: https://blogs.technet.microsoft.com/windowsserver/2017/09/22/project-honolulu-technical-preview-is-now-available-for-download/. As the management is browser based, I thought this was a perfect fit for using Azure AD and publishing the management portal using Azure AD Application Proxy, and even better to secure the access using Azure AD Conditional Access. 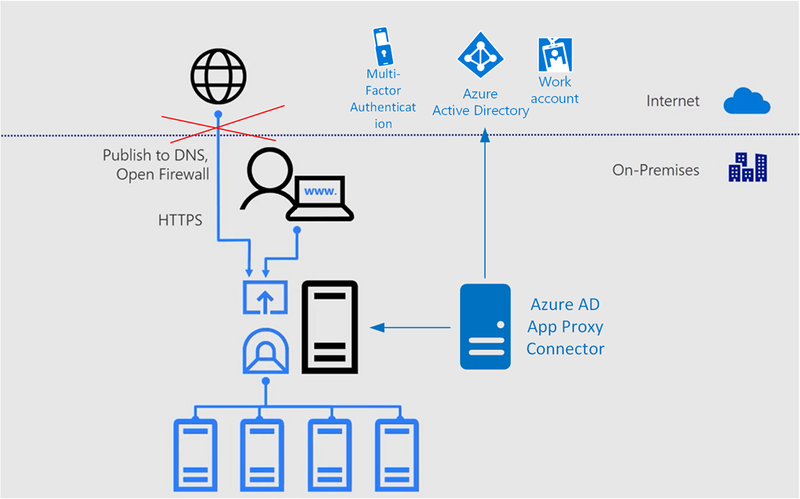 Consider the following diagram, where you instead of just publishing DNS and open Firewall to access the management server directly, I would instead use Azure AD App Proxy for secure access. So lets get started setting this up! 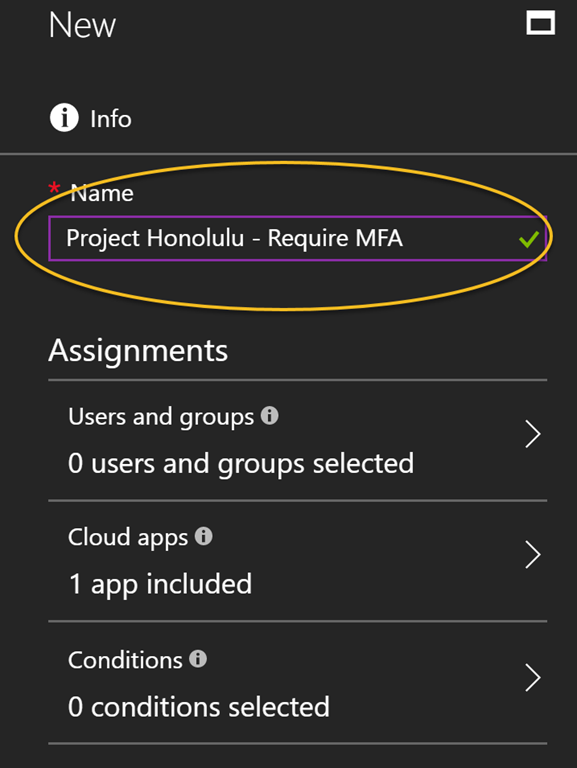 I will not get into great detail on installing Project “Honolulu” here, you can just follow the technical deployment documentation, but in my environment I have installed some servers running as Azure Virtual Machines joined to a single-forest, single-domain Active Directory. I have “on-premises” AD users and groups, and I’m running Azure AD Connect with Password Hash Synchronization. I’m now able to access the web based management internally, using https://azhon1.elven.local:6516. I can now proceed with publishing this externally with Azure AD App Proxy. Specify a Name for your application, and the Internal Url where you installed the Project Honolulu technical preview, including port number as shown below. If you want you can change parts of the External Url, even using your own domain and SSL certificate. I will just use the default here. I will use Azure Active Directory as Pre Authentication, meaning that no-one can access this website without beeing authenticated with Azure AD first. And last, I select my Connector Group of Azure AD App Proxy Connector Servers. PS! Remember that these servers need to be able to access the Internal Url directly, in case you have any Firewalls, NSGs or other components that might block traffic. User assignment is required in this configuration, so next I need to assign some users to the application. Here I have added a normal domain user and a domain admin user. Both these users are synchronized from my local AD. 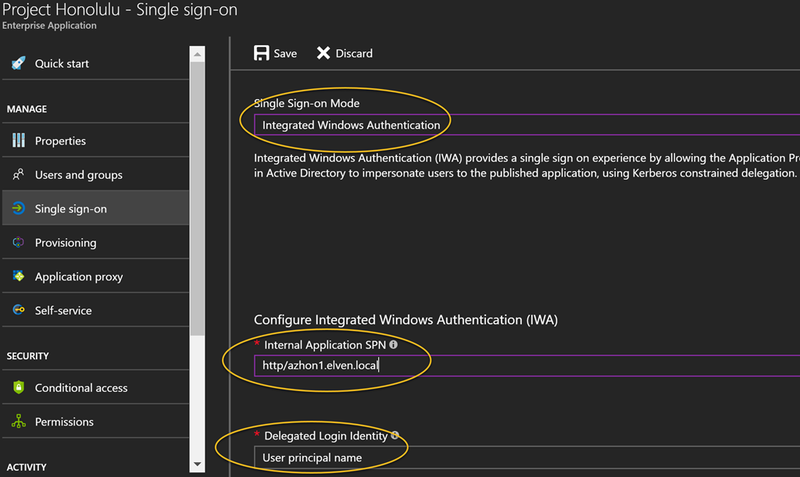 Next I wan’t to configure Single Sign-On, so that users that authenticate with Azure AD automatically will be signed in to the Project Honolulu management site. 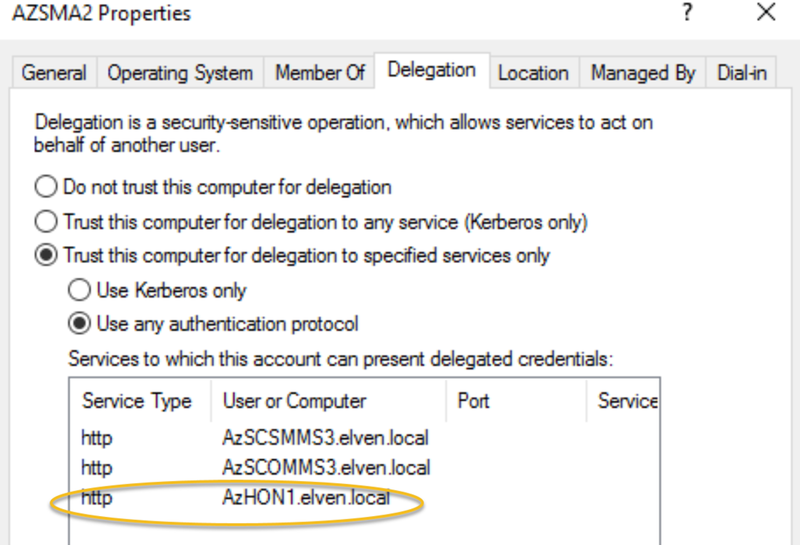 I select Integrated Windows Authentication for sign-on mode, and then I specify the internal application SPN for which is needed for Kerberos Constrained Delegation. After that I have one more important step, and that is to configure delegation at my Application Proxy Connector servers. 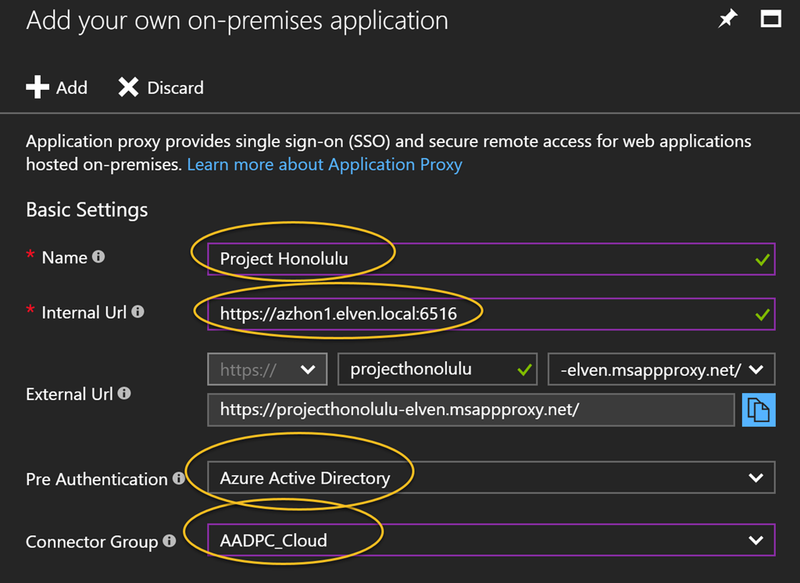 In my local Active Directory, open the Computer object for every server that acts as Azure AD App Proxy Connectors, and on the Delegation tab, add the server that you installed the Project Honolulu on, selecting http as the service. In my environment, I have added this now. I have some previous delegations for others servers as well. 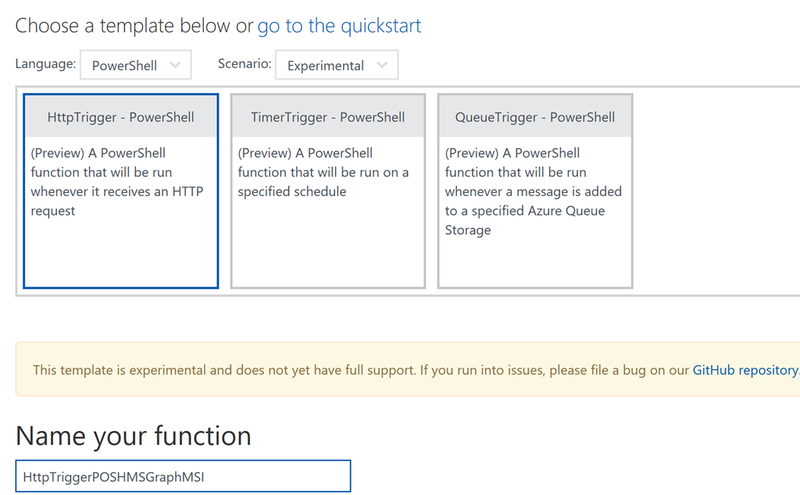 We are now ready to test the application publishing via Azure AD! So, now we have successfully configured an Azure AD App Proxy Application, and can connect securely from external url using SSO with Windows Integrated Authentication and Azure AD Pre Authentication. The application also requires that only assigned users can access the application. In the next section I will configure Conditional Access for the application. 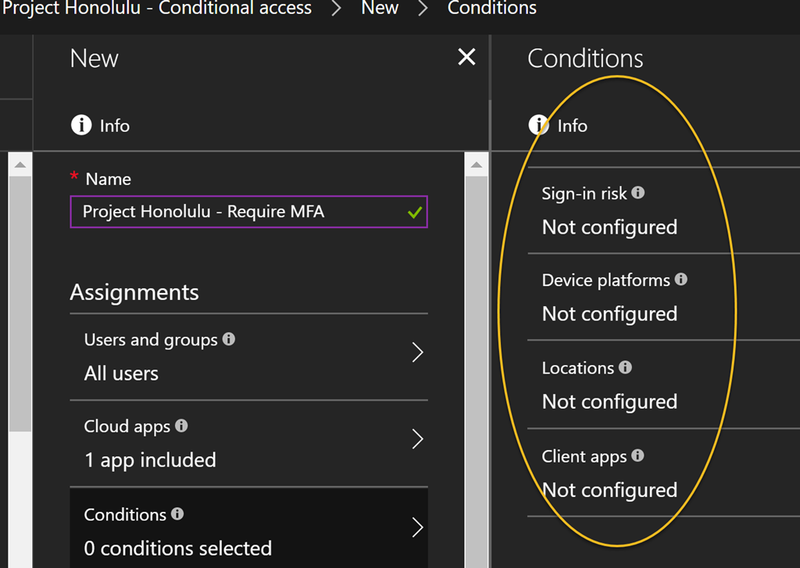 On Conditions I can optionally configure conditions for sign-in risk, device platforms, locations and client apps, but I will just let this policy apply for all conditions for now, so I’m leaving Conditions as it is. So, save the policy, and lets test how accessing the application works now. That concludes this blog post. 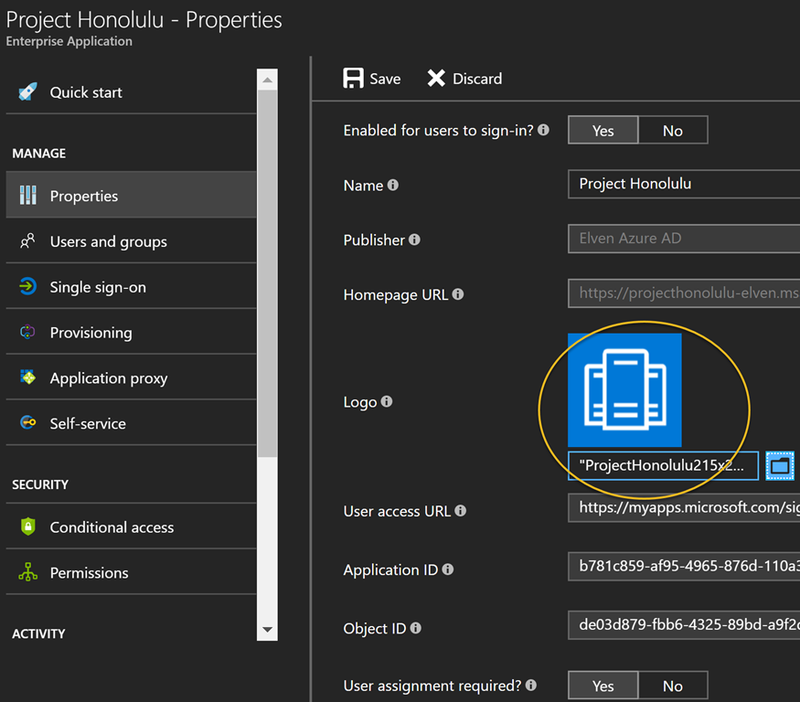 I’m very excited for this new preview for Project “Honolulu”, and using the great Azure AD Application Proxy feature I can securely publish and access the management site from external locations and clients. 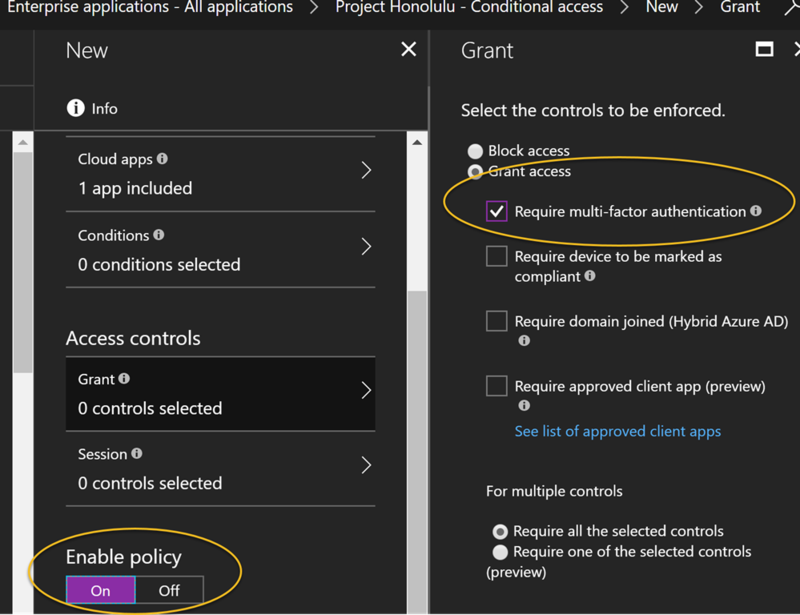 And even better with Azure AD Conditional Access, I can create a policy that sets access control for multi-factor autentication requirements, and if I want I can even control which device clients and what apps they use to access. 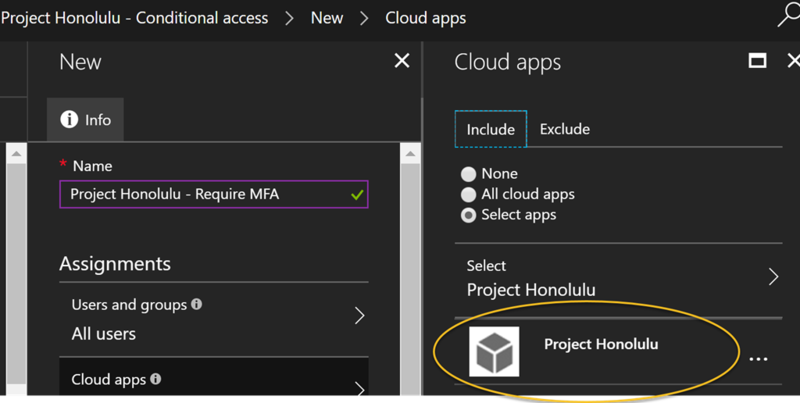 This entry was posted in Azure AD, Azure AD Application Proxy, Azure AD Conditional Access, Project Honolulu and tagged Azure AD Application Proxy, Azure AD Conditional Access, Azure Multi-Factor Authentication on September 24, 2017 by Jan Vidar Elven. Managed Service Identity makes it possible to keep credentials out of code, and that is a very inviting prospect. As I have been exploring Microsoft Graph in different scenarios using PowerShell, I thought I should have a go at using Managed Service Identity in an Azure Function and run some PowerShell commands to get data from the Microsoft Graph. Lets get started! 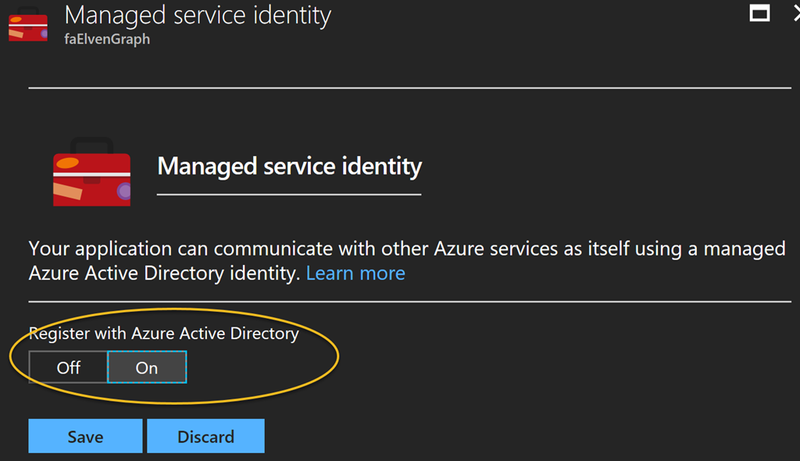 After saving you should get a successful notification that the managed service identity has been registered. 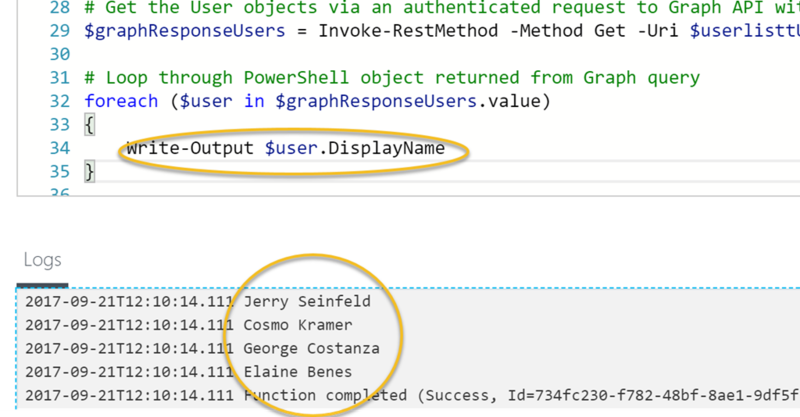 We can see that the Service Principal object is connected to the Azure Function App and of type ServiceAccount. Now, we are ready for the next step, which is to create a function that will get data from Microsoft Graph. But first we will need to give this Service Principal some permissions. Depending of what you want to do with your Function App, the managed service identity, represented by the service principal, will need some permissions to access resources. 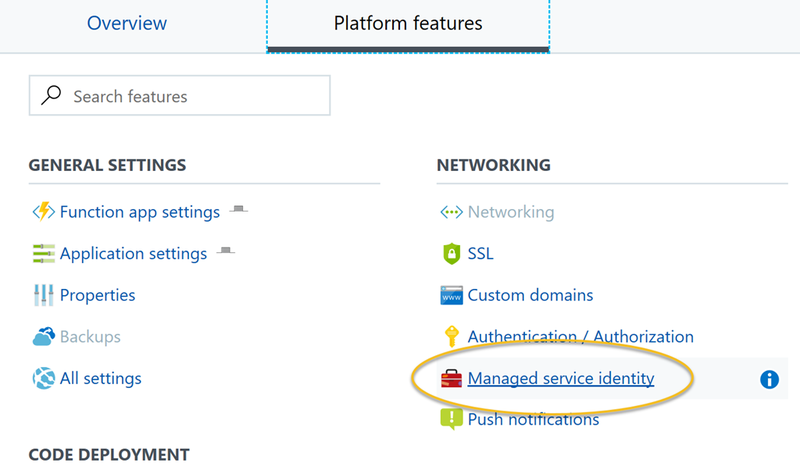 You could give the service principal rights to Azure resources like Virtual Machines, or to access Key Vault secrets (a nice blog post on that here: https://blog.kloud.com.au/2017/09/19/enabling-and-using-managed-service-identity-to-access-an-azure-key-vault-with-azure-powershell-functions/). In my scenario I want to access the Microsoft Graph, and specifically get some Directory data like user information from my Azure AD. When accessing Microsoft Graph you would normally register an Azure AD Application and set up Application or Delegated Permissions, and follow the authentication flow for that. But in this case I want the Service Principal to be able to directly access Directory Data, so I will have to give my Service Principal permission to do that. 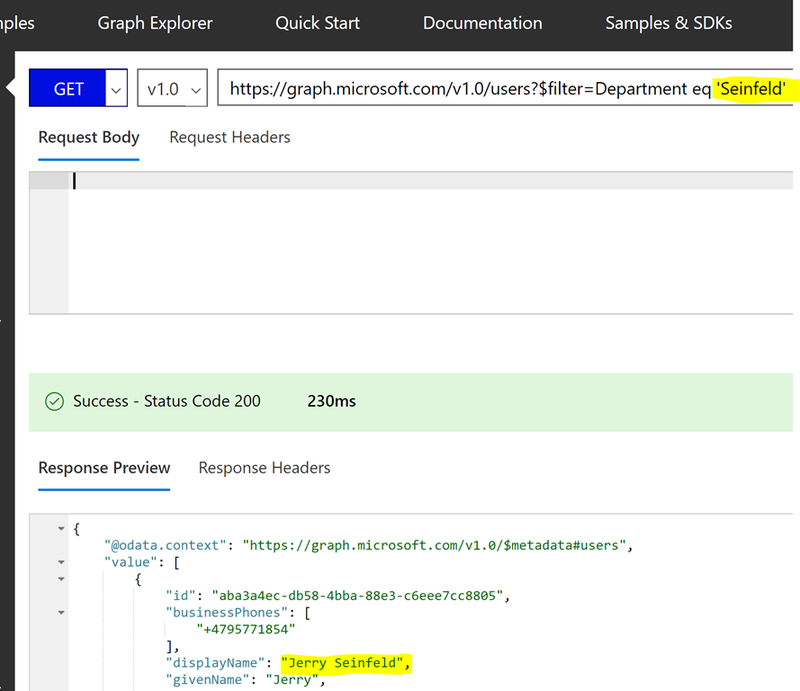 With a valid Access Token, and with the correct permissions for the resources I will want to access, I can now run some Microsoft Graph API queries. And there it is! I’m able to successfully query the Microsoft Graph using Managed Service Identity in an Azure Function, without handling any credentials. For reference, I have attached both the Azure AD PowerShell commands, and the Function PowerShell commands below from my Gist. Enjoy! This entry was posted in Azure AD, Azure Function, Microsoft Graph, PowerShell and tagged Azure AD, Azure Function, Managed Service Identity, Microsoft Graph, PowerShell on September 21, 2017 by Jan Vidar Elven. In a recent announcement at the Enterprise Mobility Blog, https://blogs.technet.microsoft.com/enterprisemobility/2017/08/31/changes-to-the-token-lifetime-defaults-in-azure-ad/, there will be a change for default settings to the Token Lifetime Defaults in Azure Active Directory for New Tenants only. This change will not affect existing old Tenants. This is great news for many customers to remove user frustration over authentication prompts when refresh tokens expired after a period of inactivity. For example, if I havent used an App on my mobile phone for 14 days, I have to reauthenticate with my work/school account again to get a new Access Token and Refresh Token. Some Apps I use quite often, like Outlook and OneDrive, and by keeping active the Refresh Token will be continously renewed as well together with the Access Token (which by default is valid for 1 hour). For my existing tenant this would mean that keeping active, and at least using the Refresh Token inside the 14 Days, I will get new Access and Refresh Tokens, but after 90 Days the Single and/or Multi factor Refresh Token Max Age will be reached, and I have to reauthenticate again in my Apps. Some Apps I will naturally use more rarely, for example Power BI, Flow, PowerApps etc. (this will be different for each user type), but I risk having to reauthenticate every time if I only access these Apps every other week. So for New Tenants this has now changed, as Refresh Tokens will be valid for 90 Days, and if you use the Refresh Token inside that period, you will get 90 more days. 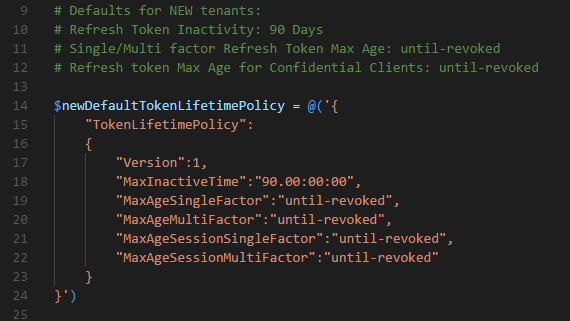 And furthermore, the Max Age for Single/Multi factor Refresh Token will have a new default of Until-revoked, so basically it will never expire. Keep in mind though, that Azure AD Administrators can revoke any Refresh Token at any time. Refresh Tokens will also be invalid if the authenticated users password changes or expire. It is also nice to be aware of that every time a Refresh Token is used to get a new Access Token, Conditional Access and Identity Protection from Azure AD will be used to check if the User or Device is in a Compliant State with any policies defined. A few words on the Confidential Clients also. Confidential Clients are typically Web Apps that are able to securely store Tokens and identity itself to Azure AD, so after the User has Authenticated and actively Consented to access specific Resources, the resulting Access and Refresh Tokens can be used until revoked, as long as the Refresh Token are used at least once inside 90 Days (New Tenants) or 14 Days (Old Tenants). 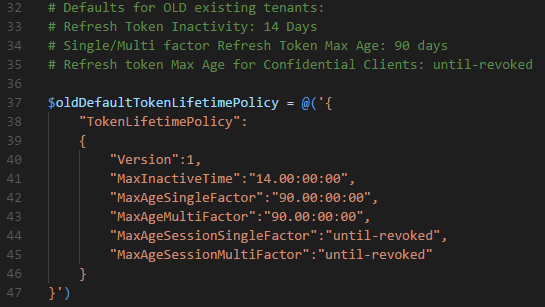 If you want to read more deep dive on configurable Token Lifetimes, you can follow this link: https://docs.microsoft.com/en-us/azure/active-directory/active-directory-configurable-token-lifetimes. I have created some Azure AD PowerShell V2 examples for how you can change the Token Lifetime Policy defaults in your organization. The complete list of Azure AD PowerShell CmdLets used and examples can be found here at my Gist repository. Hopefully this has been informative and helpful for Azure AD Administrators and others ! This entry was posted in Azure AD, PowerShell and tagged Azure AD, PowerShell on September 1, 2017 by Jan Vidar Elven.